So what next? 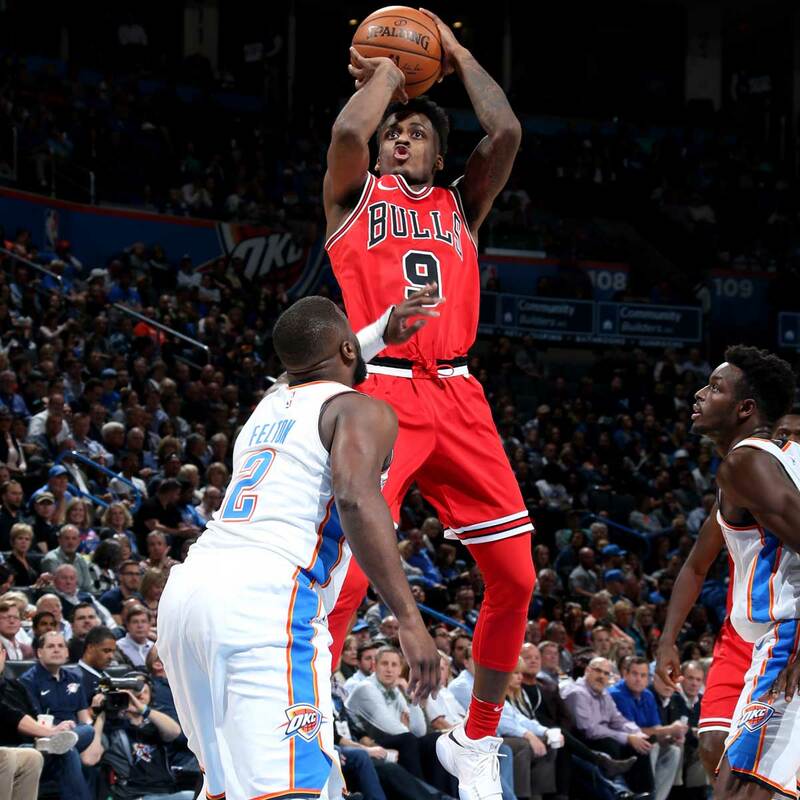 How about starting at shooting guard Antonio Blakeney, who Wednesday was co-leading scorer in the Bulls 92-79 loss to the Oklahoma City Thunder. The Bulls for the second consecutive game trailed by at least 20 points after the first quarter, this time after a franchise low first quarter seven points on two of 16 shooting with eight turnovers. The Bulls have to, at least, begin again to display a competitive front after their fifth consecutive loss dropped them to 2-10. But it's not so much the losses, which were expected, but the way they now are coming. 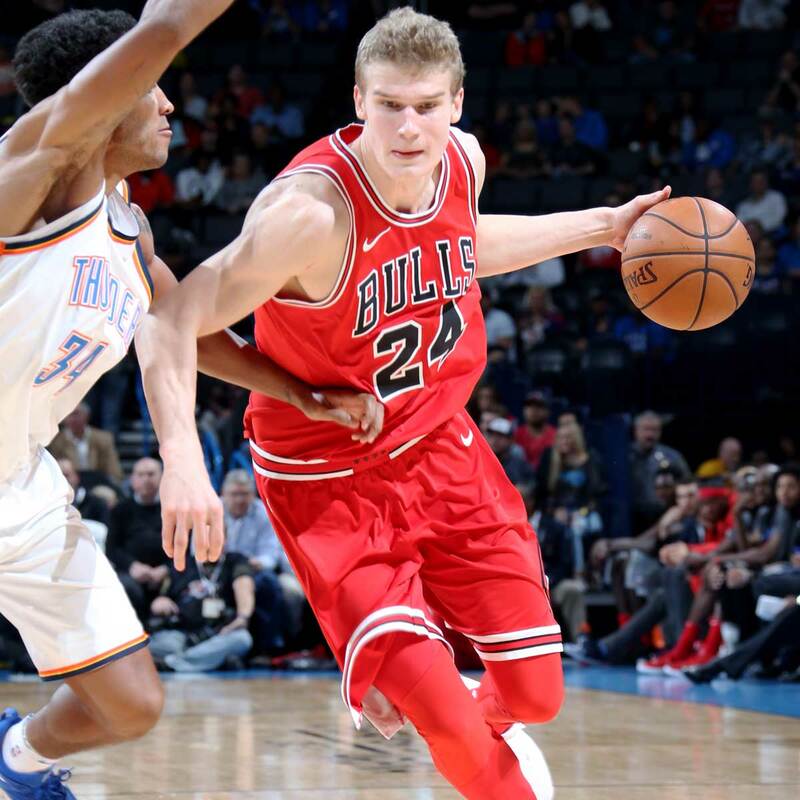 "The previous game (against the Spurs) we didn't compete at all," agreed rookie Lauri Markkanen, who also had 16 points Wednesday. "Today was a little better, especially in the second half. We came back a little bit. Today and the last game, at the start of the game we haven't been able to get it going. We have to come out and play hard. Second half, we were already down 20, and, of course, everyone is mad and had better energy; we just have to find that energy from the tip. If we are competing at the level that we have been practicing, then we are going to win a lot of basketball games. But we have to give ourselves a chance and come out the gates playing hard. When the game starts we have to be ready to play." The Bulls have not been ready these last four games, averaging a 15-point deficit after the first quarter in that stretch. The Bulls were without one of their best scorers, Justin Holiday, who was home with the birth of his first child. But that's hardly an excuse or explanation for yet another apathetic start. Bulls coach Fred Hoiberg talks about sagging shoulders with missed shots, many of which are open. But Kris Dunn, getting his first Bulls start in the backcourt, and backcourt mate Jerian Grant were unable to get into the lane and create for others. That left too many rushed, and often difficult, perimeter shots. Only Markkanen and Denzel Valentine, the latter off the bench with 13 points, made any shots in that first quarter. By the end of the first quarter trailing by 20 points and by 26 eight minutes into the fourth quarter, the game, effectively, was over for the Bulls. However little it meant, the Bulls outscored the Thunder in the second half. "You just don't give yourself a chance when you come out of the gate with these types of starts," lamented Bulls coach Fred Hoiberg. "It didn't exactly make it a nail biter, but we won the second half. We fought from the second quarter on, but we were down 20 after the first quarter with a seven-point quarter. You're not breeding any confidence for yourselves, so it's just a mindset." The Bulls got the rare offensive boost from G-league player Blakeney. He's a shoot first player; actually pretty much shoot all the time. But he's probably the best player on the roster now with Zach LaVine and David Nwaba out with injuries who is able to create his own shot and score. Blakeney was averaging 39.5 in two G-league games under his two-way contract that gives him 45 days with the Bulls under the new rule. He had played just one minute previously with the Bulls. He had a shaky first half with a pair of turnovers, one of three shooting and likely some nerves. After that he was nervy with 12 points in the second half in 15 minutes and two of four on threes. Sure, the Thunder was coasting by then with Russell Westbrook, Carmelo Anthony and Paul George limited. Westbrook led the Thunder with 21 points, seven assists and five rebounds. But Blakeney in addition to his shooting range showed an ability to get inside the extended perimeter for better shots. He's not likely to make many passes, but he can find shots and make them. It's not common lately among teammates. The Bulls starters other than Markkanen were a combined four of 26 shooting with Dunn and Grant a combined two of 16 with six assists and six turnovers. Perhaps a perimeter with Dunn, Blakeney and Holiday and Markkanen and Robin Lopez inside? The response might be whether it is unfair to others, more veteran and experienced players. But at this point in this sort of sequence of uncompetitive losses, if you think you are a better player, then you need to show it. Grant has had a run as starting point guard, but he didn't start the second half. Hoiberg went with Valentine, who had a strong scoring second quarter. But it's getting to the point the Bulls need to have their best, most aggressive scorers on the floor to start games. No matter their credentials. I think the whole season is going to be part of the learning process for us...We are young and we need to learn how to grow, improve, take it to another game and try to learn from it. The Bulls put up little resistance to start. The Thunder is one of the league's best defensive teams, and they forced the Bulls into turnovers and poor shots; after awhile, Bulls players were taking 30 foot threes just to get shots off. On offense the Thunder, just 7-7, spun the ball around to wide open shooters as the Bulls changed up some and made some desperate attempts to trap on defense. But with Westbrook able to break down the perimeter, the Bulls too often had to fall back into the lane and scramble. From there, the Thunder found shooters and lanes open for drives. After a scoreless first quarter, Westbrook took over in a Thunder second quarter stretch when they ran up a 49-23 lead with just under four minutes left in the half. This was after the Thunder last month beat the Bulls 101-69 in never trailing in that game, also, and holding the Bulls to an eight-point quarter. Westbrook dunked three times in five possessions in an 8-0 run, blowing by Lopez on a switch, beating Dunn off the dribble and then stealing a lazy inbounds pass from Quincy Pondexter, who started the game for Holiday. "I think the whole season is going to be part of the learning process for us," said Dunn. "We are young and we need to learn how to grow, improve, take it to another game and try to learn from it." It was 58-34 Thunder at halftime. And though there were some second half moments, like a fast break dunk from Markkanen, Blakeney's scoring and a bit more purpose from Cristiano Felicio, the Bulls again lacked that competitive edge to start. Bobby Portis had his first poor game since his return from suspension with a zero for five shooting start. He ended with five points and a team high nine rebounds. Though the maxim is NBA games are decided in the last five minutes, the records show first quarter leaders most often win games. It's a game of momentum as well. And a game of adjustments. The Bulls again seem ready for some.